GALION — Warmer weather gives way to the graduation season for high school seniors. But it’s also a time for another type of graduation ceremony that focuses on younger students making a commitment to staying drug and alcohol free, and making good choices. Galion sixth-grade students participated in the middle school’s DARE graduation party for the first time in more than a decade on May 8. The DARE program gives students the opportunity to meet and interact with local law enforcement officers while they are still in the formative stages of their lives. 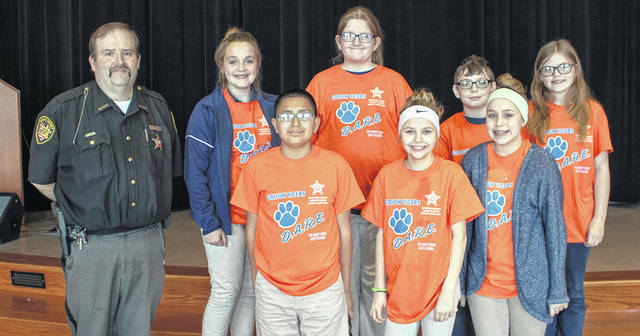 Working with students at this age gives Crawford County Sheriff’s Office Deputy Christopher Martin the opportunity to show students a side of law enforcement they don’t usually see. Martin recognized the DARE essay contest winners during the celebration. Students were asked to write about the DARE program and what it meant to each of them. Winners included Jaydon Conlen, Luke Tinnermeier, Madison Peden, Jada Wright, Levi Graham, Emma Ross, Whitney Kimble and Jasmine Butterfield. The Crawford County DARE program serves approximately 3,000 students from eight schools in Crawford County. The program is supported by Crawford County Sheriff Scott Kent and receives a small grant from the Ohio Attorney General’s office.To learn more about the Crawford County DARE program, please contact Crawford County Sheriff’s Deputy Christopher Martin at the Crawford County Sheriff’s Office at 419-562-7906. Courtesy photo Crawford County Sheriff’s Deputy Christopher Martin presented certificates to Galion Middle School sixth graders students (front row) Luke Tinnermeier, Whitney Kimble, Jada Wright and (back row) Emma Ross, Jasmine Butterfield, Levi Graham and Madison Pedon as D.A.R.E. essay winners during the Middle School’s DARE celebration. https://www.galioninquirer.com/wp-content/uploads/sites/38/2018/05/web1_galion-dare-essay-winners.jpgCourtesy photo Crawford County Sheriff’s Deputy Christopher Martin presented certificates to Galion Middle School sixth graders students (front row) Luke Tinnermeier, Whitney Kimble, Jada Wright and (back row) Emma Ross, Jasmine Butterfield, Levi Graham and Madison Pedon as D.A.R.E. essay winners during the Middle School’s DARE celebration.